Russian Foreign Minister Yevgeny Primakov has said the Russians have done everything possible to discover the fate of Raoul Wallenberg, the Swedish diplomat who saved thousands of Hungarian Jews from the Nazi holocaust. Wallenberg disappeared in 1945 after being arrested by occupying Soviet troops. He was aged 32. Mr Primakov, for the first time, described Wallenberg’s arrest as « criminal ». But he said there was no reason to doubt that Wallenberg died in a Moscow prison in 1947 of a heart attack. Many people, including his family, question the official version of his fate. There were a number of unsubstantiated reports of sightings of Wallenberg into the 1970s. This led to the belief that he may have survived. 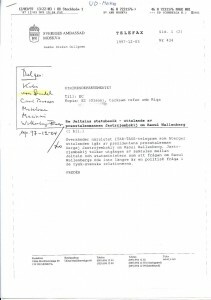 Översänder närslutet ITAR-TASS-telegram som återger uttalanden igår av presidentens presstalesman Sergej Jastrzjembskij om Raoul Wallenberg. Jastrzjembskij tolkar utgången av samtalen mellan Jeltsin och statministern som att frågan om Raoul Wallenbergs öde inte längre är en politisk fråga i de rysk-svenska relationerna.